The snowcapped, jagged Grand Tetons in northwestern Wyoming in America are one of the world's most scenic mountain ranges. Many non-French-speaking tourists are unaware that French fur trappers named the range after a part of the female's anatomy. The highest peak is 4198 meters (13,770 feet) high and is simply called the Grand Teton. It is clustered with other skyscraping summits (see photo). Locals call it by an even simpler name, "The Grand". 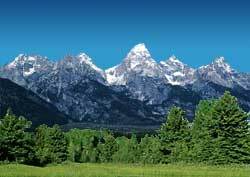 Although their maximum height is less than half that of Mount Everest, the Grand Tetons rise about 2200 meters (7,000 feet) sharply above the Jackson Hole Valley floor. And, there are no foothills in the foreground to lessen the impact of their majestic presence and the seven reflecting lakes that lie at its feet. The peaks are a paradise for serious mountain climbers. Many come here to hone their skills before heading off to the Himalayas.